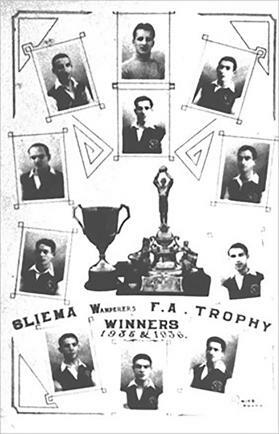 A postcard issued in 1936 to mark Sliema Wanderers’ victory over Floriana in the FA Trophy final. In 1936, a new format was adopted for the FA Trophy. The leading clubs, Floriana, Sliema Wanderers and Hibernians, were each awarded byes to the semi-finals as the three Division One ‘B’ sides, together with Valletta City and Msida St Joseph, were pooled together in a mini-tournament to decide the fourth semi-finalist. In the first match, Qormi St George’s met Valletta City in what everyone thought would be a keen and close cup tussle. This match, however, was an anti-climax for Qormi turned up with only nine men. Rossi, the City centre-forward, helped himself to a hat-trick while Zahra, Camilleri and Tanti scored the other three. With Valletta taking things easy and Qormi too weak to react, the end could not come too soon. The next qualifier fully compensated for the fiasco of the first one. Msida SJ and Floriana Tigers were the protagonists of a very keenly contested game. Zammit scored first for Msida but Borg equalised immediately afterwards. For the rest of the game play was evenly divided until, with the spectators already leaving the ground, H. Azzopardi scored the winner for the Tigers. On April 11, Valletta City drew 1-1 with Sliema Rangers. Valletta scored first when after only four minutes Rossi converted a penalty but within a minute of the re-start Rangers drew level through Borg who headed in. At this point the referee lost control and there were charging bouts and rough play. Towards the end, Tanti, of Valletta, and Rangers goalkeeper Holland came to blows and were both given marching orders. The game was stopped for nearly 10 minutes among many scenes of violence both on and off the field which continued up to the very end. Valletta’s progress continued when they beat Sliema Rangers 2-0 in the replay. Extra time was necessary before the Citizens could eliminate Rangers. Rossi scored with a first-time shot and towards the end he scored again to make the issue safe for his team. Valletta’s adventure continued on April 25, against the Tigers. The latter took the lead after only seven minutes. Happy with their lead, the Floriana boys settled back in defence but a few minutes before the interval Galea equalised for City. In the second period both teams was awarded a penalty. Dowling netted for Valletta but the Tigers missed their chance. The Greens now attacked desperately but Valletta somehow held on until a few seconds from time when the Tigers were awarded a second penalty. Amidst dead silence Debattista scored with a hard drive. There was no time for the re-start and the match had to be replayed. On May 2, the Tigers played their best match of the season and two goals each by Azzopardi and Agius gave them a merited 4-1 victory over Valletta City. In the semi-final, Hibs stretched Sliema Wanderers to the limit but a Tony Nicholl goal in the first minutes of the second half gave the Blues a rather flattering victory. While the Wanderers had to strain every nerve to reach the 1936 cup final, Floriana simply had to walk there. The Greens’ opponents in the semi-finals were their neighbours and friends, the Tigers. Floriana were hardly ruffled and they left the stadium the victors 3-0. This match was proof, if any was needed, that clubs from the same district should never be allowed to play in the same competition. Those days, the Tigers and the Rangers were nothing more than the reserves of Floriana and Sliema Wanderers. The final was a repetition of the previous year’s title match when the Wanderers had trounced Floriana 4-0. This time the result was closer but the Blues prevailed 2-1. At half-time Sliema led 2-0, Nicholl and Callus were the scorers. In the second half Floriana desperately tried to get on level terms but had to wait until the 79th minute to pull one back when a shot from Storace rebounded off the crossbar to Mayerhoffer who hit the ball into the Wanderers’ net. Floriana now went forward as Sliema’s time-wasting tactics angered the crowd but the plan worked and at the end the result remained unchanged. Once again, the Greens had failed to win the new trophy.